If you’re bored in Halifax Stanfield International airport, you can always watch the birds in the central atrium. They’ll be watching you anyway. The atrium is full of cheerful chirping. There’s a sign that asks you not to feed the birds, so apparently their presence is intentional. These aren’t pigeons or ducks that walk around on the floor; they’re little songbird types, and they mostly fly from rafter to rafter way up. If no one’s around they’ll swoop down to the level of the tropical plants behind the benches. Next time (especially if I’m just picking someone up), I’ll bring my binoculars. The only one I saw close enough to identify was a house sparrow. But they aren’t all house sparrows, that much I could tell. So, does anyone know about the birds in the airport, how long they’ve been there and what species they are? Chickadees live in a faster time dimension than we do, says my friend Dennis Robinson who has developed a close relationship with the birds around his home in the Annapolis Valley. They are acutely aware of their surroundings, and communicate what is going on with each other, with other birds, and – because he listens – with him. An intruder to their space is news, whether it is a new bird or a human. Even a day later it can be big news, as he found when he returned home to find the grass torn up by ATV wheels and the chickadees unusually talkative. 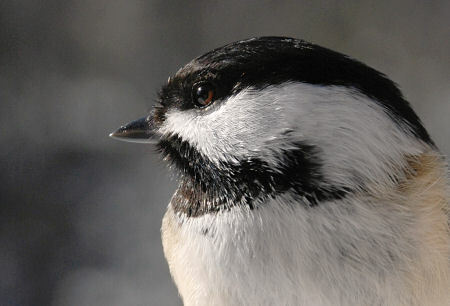 See more of Dennis’ photos on our Chirbles the Chickadee page. I was chasing rainbows again yesterday. So what exactly does the end of the rainbow look like? 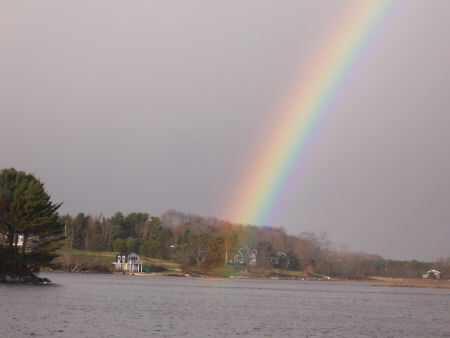 In this picture, the rainbow comes down in front of the trees and lands in the water. 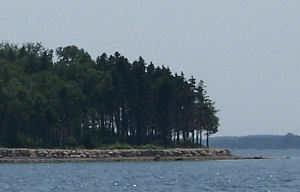 Actually, there used to be an island there; now it’s a shoal, where seagulls and cormorants like to roost. Someone, apparently, thought the Oak Island treasure had to be there, and dug up the island (which is located near Oak Island), looking for it. If there’s a pot of gold at the end of the rainbow, maybe he was right! 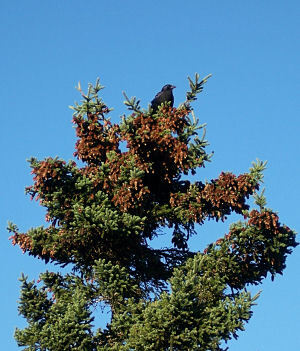 There is a traditional rule that says when the cones are set high in the trees, you can expect a lot of snow the following winter. If it’s true, and if this tree in Feltzen South on Lunenburg Bay is reliable, then we’d all better make sure our snowblowers and plows are working, to say nothing of getting our backs in shape. The crow in the picture is staking its claim over a reliable food supply. Crows are no fools. 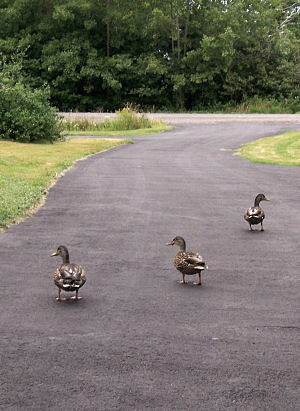 These intrepid ducks were not at all shy as my husband herded them out of the garden and back down the road. I bet they’re happy now: it’s pouring rain. Danny was briefly a hurricane but is down to a post-tropical storm that will pass south of Nova Scotia on a similar path to Hurricane Bill. After a beautifully sunny, but cool, week, the gardens will love the rain. But weekend campers are out of luck this time. It seems to have been a bumper year for ducks. 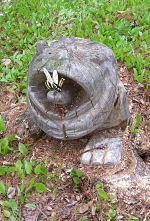 Near our place, we’re blessed with lots of natural shoreline where they can build nests. Elsewhere, and where people have the money, they build walls of boulders at the high tide line to shore up their lawns and act as a buffer against erosion. But those neat and tidy rock walls are bad news for nesting shorebirds. 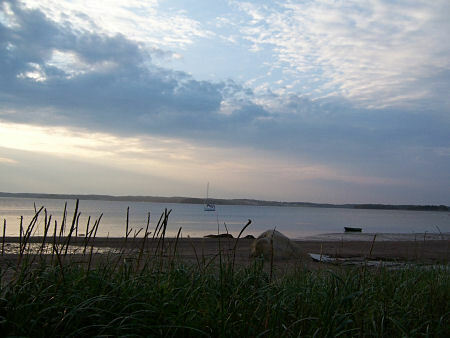 Sunset at Covey Island, one of the islands protected by MICA. The first settlers of Lunenburg must have been in awe at such freedom. What we now call Germany was at the time an assortment of many principalities of various sizes. Going down the “highway” of the river Rhine to Rotterdam, where they boarded the ship that would take them across the Atlantic, the emigrants would have been stopped at every border crossing and paid tolls. Many of them had even needed to secure permission from their feudal lord to leave the land they were bonded to as peasants. Once they reached Lunenburg in 1753, they must have been very appreciative of the freedom to profit from their own labour and build their future with their own hands. 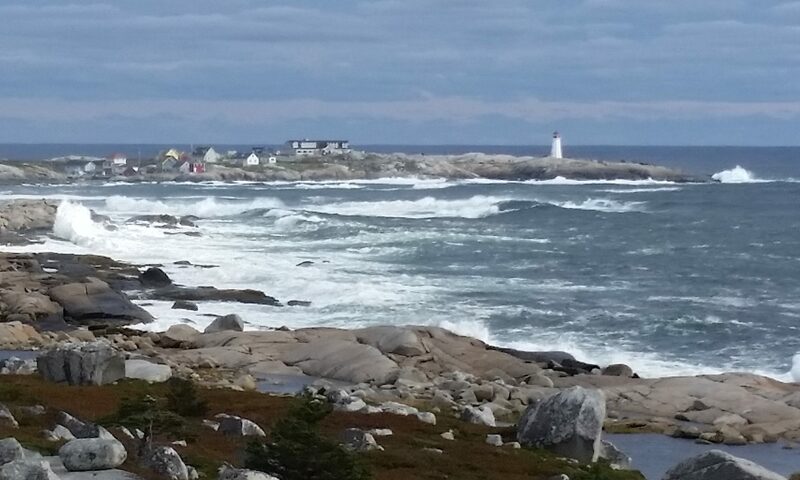 Even some of the modern-day German immigrants to Nova Scotia that I know have expressed to me their appreciation of the freedom they have here in a society that is less regulated than the one they left behind. The entire natural coastline of this island has been destroyed and replaced with a rock wall. From what I understand, depending on the type of deed, the intertidal zone has legally remained public except in a few cases where water rights were transferred. In a country where travel by boat was the norm, the right to land on a shore would have been an issue of public safety. Nowadays, it seems that there is a trend for private property rights to be extended into the intertidal zone – whether by deed, by custom, by complicity of the authorities or by ignorance by the public, I don’t know. Enlighten me if you know anything more about this issue, please, by commenting below. Meanwhile, I take pleasure in seeing the decendants of the original Lunenburg settlers, with names such as Meisner and Ernst, involved in MICA, perserving public access to the islands of Mahone Bay for future generations of humans and seabirds. 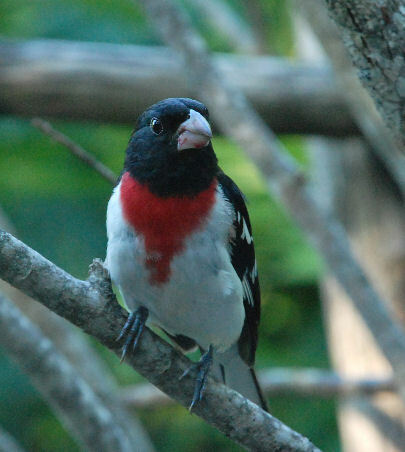 A male Rose Breasted Grosbeak. What a handsome fellow! Photographed near Blomidon on July 20 by Dennis Robinson. Spotted on May 27: Ten downy ducklings under the watchful eye of their American Black Duck mother. 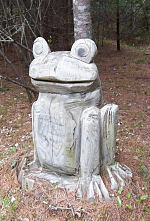 We had an adventure ramble in the woods during a kid’s birthday party in Chester Basin. 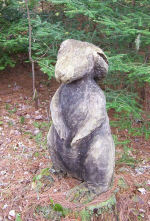 A neighbour had carved animals out of tree stumps and we had to discover them all. We never did find the bear – maybe it was hibernating. Dennis writes, from the Valley: “The first one arrived yesterday, buzzed right up to my face and looked in the window as if to say, ‘Where is the feeder?’ Within 10 minutes it was prepped and hanging outside the door. By 6 p.m. one male was giving another a feisty seminar on real estate law. Hours of entertainment to follow…. 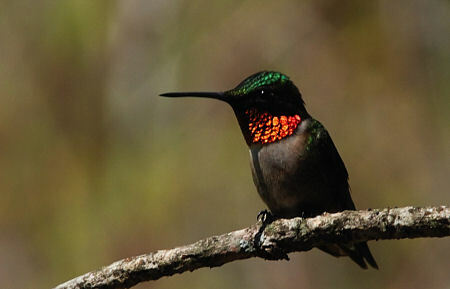 Post your hummingbird sightings here, from year to year, for the record!